For fans and enthusiasts of the paranormal, John Zaffis is something of a legend. Known as the "Godfather of the Paranormal," he is a noted researcher, religious demonologist, nephew to famed investigators Ed and Lorraine Warren, and has been involved in some of the most intense ghostly and inhuman paranormal cases out there (including A Haunting in Connecticut ). Zaffis is the author of Shadows of the Dark , has been on countless installments of paranormal pop culture, and beginning June 1, he will be leading his own show on Syfy - Haunted Collector - along with his son Chris, daughter Amy and paranormal investigators Beth Ezzo and Brian Cano. The show will follow Zaffis' team as he tracks down "possessed possessions" such as paintings, guns, jewelry and antiques to be stored in his museum. Within the paranormal reality-TV genre, there are a lot of "stars" who emerge out of nowhere, but Zaffis has this stuff in his blood and has been in the investigative field for decades. And to receive a blessing (as in approval, not prayer ... although he knows some people who can help with that, too) from him means something significant. As such, Zaffis is one of my first resources when I'm looking for background and theories on all manner of paranormal activity. He is also a hell of a funny guy. 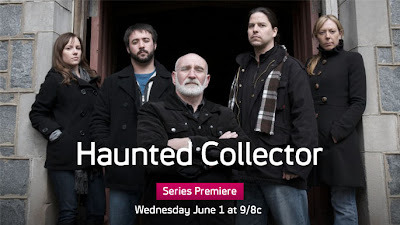 I don't know what the finished product of Haunted Collector will look like, but if you're interested in a show spotlighting a true heavyweight within the paranormal, you'll be tuning into Syfy on June 1.